Embed a web page into your story to combine your analytics with additional live, hosted content. Choose Web Page from the toolbar on the Story page. A blank Web Page is added to your canvas, and the Edit Web Page panel is displayed. Go to the Edit Web Page panel, add a title and URL, and then choose OK. Web pages using HTTP instead of HTTPS may be blocked by your browser when embedded into a story. Only embed web pages from a source you trust. You may see the error Invalid URL security settings in the Web Page Address field. 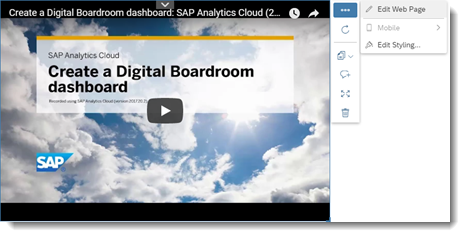 To embed web pages into SAP Analytics Cloud, the website must grant access to all external sites or specifically trust the SAP Analytics Cloud domain. Contact your administrator to verify the website you wish to embed is trusted. For administrators: Check the HTTP response header of the target website to see if the browser allows embedding the web page. In Google Chrome: Content-Security-Policy must be set to frame-ancestors <source>, where <source> is your SAP Analytics Cloud URI. Or X-Frame-Options can also be set to SAMEORIGIN if the target website is seen as the same origin as SAP Analytics Cloud. For example, if requests are configured through a web proxy. In Internet Explorer: X-Frame-Options must be set to ALLOW-FROM <URI>, where <URI> is your SAP Analytics Cloud URI. This option can also be set to SAMEORIGIN if the target website is seen as the same origin as SAP Analytics Cloud. For example, if requests are configured through a web proxy. The Web Page tile on the canvas loads and displays the current URL and can be refreshed by choosing . You can change your settings by selecting Edit Web Page on the Web Page tile in the canvas. Once a web page is added, there are a few limitations to consider when viewing and interacting with the story, or when presenting the story in a Boardroom meeting. Full screen mode is not supported for videos streamed on the web page. Embedded web pages in a story cannot be exported to PDF. Stories saved to PDF will include a placeholder message where the embedded web page is located. Choosing on the tile only refreshes to the original Web Page Address you specified above. If you navigate away from this page within the tile, you cannot refresh to that new page. For administrators: Only web pages that are of the same origin (protocol, port, and host) can be used in a Boardroom agenda (same-origin policy). To allow embedded web pages from a different origin to be presented in a Boardroom agenda, set up a web proxy to handle requests to and from this web page. Use this only for websites you trust. External web addresses are not supported during online meetings (same-origin policy). Contact your administrator if you see this kind of error message when trying to show an embedded web page during a Boardroom meeting. Video streaming is not supported. Only the meeting organizer can interact with the embedded web page. For example, refreshing or navigating. Meeting participants may see results different from the meeting organizer on dynamic pages. Scrolling is not supported in the web page tile. Size the tile appropriately in your story before presenting to meeting participants.